Now, thanks to BAS researcher Nigel Meredith, these sounds are making their way into art, music, and even the video game Elite Dangerous. Space weather—from dazzling auroras to dangerous geomagnetic storms—occurs when charged particles from the Sun bombard and interact with Earth’s magnetic field. 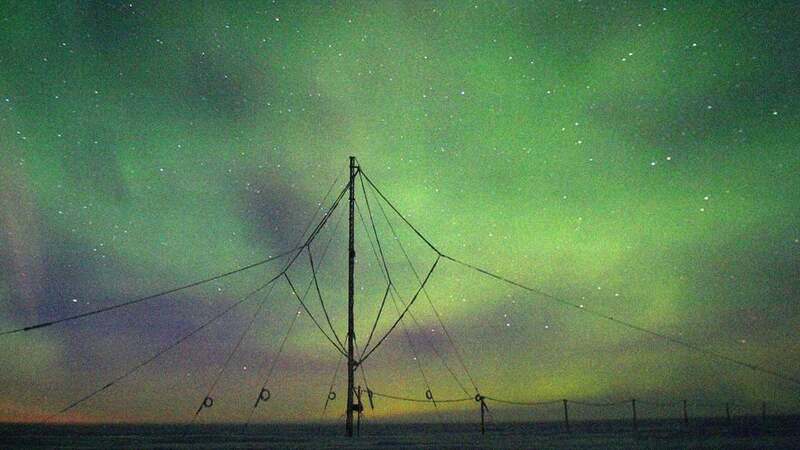 Scientists have numerous tools for studying these phenomena, including the BAS’s Halley Research Station, which uses very-low-frequency radio receivers to detect electromagnetic waves produced by lightning and geomagnetic storms from its perch on Antarctica’s Brunt Ice Shelf. Data from these waves, along with data collected by satellites, feeds into forecasting models that can help Earthlings prepare for big space weather events, which can disrupt satellites and even electrical grids. But the radio waves collected at Halley also happen to fall within the frequency range of human hearing, and audio software can be used to convert these electromagnetic signals into actual noise. And it turns out this noise is some delightfully spooky stuff. Check it out here. A couple of years back, Meredith started collaborating with artist-engineer Diana Scarborough on “Sounds of Space,” an art project focused on finding creative ways to share Halley’s sounds with the public. He gave a talk on the project at the Cambridge Science Festival in 2017, where an audio engineer from Elite Dangerous happened to be in the audience. Their chance encounter led to a more formal meeting and eventually, a partnership to incorporate sounds collected by Halley into a gameplay update released on 11 December. Elite Dangerous, for the uninitiated, is a 1:1 replica of our Milky Way galaxy in which players can trade, fight aliens, or simply explore 400 million procedurally generated star systems. The game is known for hewing to astronomical accuracy whenever possible—by chance, it basically recreated TRAPPIST-1, a system of seven exoplanets NASA announced last year—but with this latest update, players can scan planets across the galaxy and hear sounds based on data picked up at an Antarctic research station. “When we started updating our exploration gameplay for the latest game update, we knew instantly that the BAS sounds were a perfect fit,” Joe Hogan, lead audio designer for Elite Dangerous, said via email. The team, Hogan said, wanted players to feel like scientists “tuning an old analogue radio, focusing in on signals from planets, stars, and more” while they’re exploring. The sounds adapted for the game come in a variety of flavours, based the phenomenon of origin. Lightning storms, for instance, release pulses of radio energy known as “spherics” which sound like hail rattling against a pavement. Some energy from lightning can also escape Earth’s atmosphere before being dragged into the opposite hemisphere along magnetic field lines. This produces descending tones dubbed “whistlers,” which sound like something the Starship Enterprise’s comm system might pick up from the far end of a wormhole. Finally, there are what Meredith calls “choruses,” emissions generated within Earth’s magnetosphere as it’s being pelted with charged particles from the Sun. Oddly enough, these sound like bird calls and insect buzzes; you can imagine you’re in a rainforest on a distant Earth-like planet. “It’s mind-blowing that you get such fascinating (and baffling) audio from listening to nature throwing a ton of solar wind at a magnetic ball,” Hogan said, adding that the sheer volume of audio the BAS has catalogued over the years was “simply staggering” for his team to work with. If intergalactic exploration isn’t your thing, there are other ways to enjoy these geomagnetic soundscapes. Meredith and Scarborough recently teamed up with composer Kim Cunio and dancer Becky Byers to create a multimedia show using Halley’s sounds, which was performed at the BAS Aurora Innovation Centre in Cambridge in November, with more performances planned for 2019. You can watch the entire November performance below—or, if you’re really feeling like freaking yourself out, might I suggest popping it on in the background while enjoying a silent viewing of John Carpenter’s The Thing? ‘Sounds of Space’ were supplied by scientists at British Antarctic Survey.